Every Los Angeles Dodgers fan’s worst fears were realized Monday. 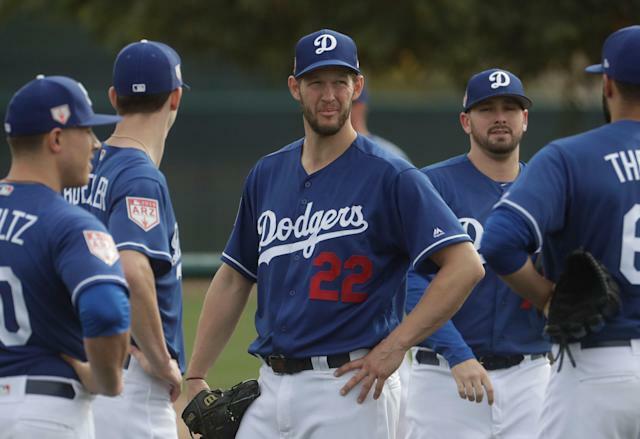 Manager Dave Roberts announced Clayton Kershaw would not be ready in time for opening day. The 30-year-old Kershaw has missed time this spring due to an arm injury. He’s made progress in recent weeks, but was unable to recover fast enough to start on opening day. He’s been the team’s opening day starter every season since 2011. With Kershaw sidelined, Roberts will have to decide which Dodgers starter gets the nod instead. He’ll have plenty of options to choose from. Veterans Rich Hill and Hyun-jin Ryu are both coming off strong seasons. Walker Buehler was the team’s best starter last season, but has been brought along slowly during camp. He’s expected to pitch Wednesday, and could still get the nod if he performs well. It’s unclear how much time Kershaw will miss due to the issue. While things looked grim early on, Kershaw has been ramping up his activity in recent weeks. He was able to throw a bullpen session Sunday, and reportedly came out of that with no issues. He still needs to progress to throwing to live hitters before he starts seeing game action. In 161 1/3 innings last season, Kershaw posted a 2.73 ERA. Until Kershaw can return, the Dodgers will have to find a way to tread water without him. That shouldn’t be much of an issue for the club. The Dodgers have gone through stretches without Kershaw in each of the past three seasons and have still made the playoffs each year. For Los Angeles, the goal the past couple seasons has been to make sure all of its starters are healthy in time for the postseason. As long as that’s still on the table, there’s no need for Dodgers fans to panic just yet.